A power washer can make cleaning surfaces much easier. This is why many people are turning to concrete surface cleaners to use with their power washer to help clean surfaces that previously took a long time to clean or could not be cleaned thoroughly with a simple water hose. By choosing to use surface cleaners to clean those flat surfaces, you can save yourself time, water, and money. How do flat surface cleaners work? Concrete surface cleaners normally have two to three arms that spin around at up to 1800 RPM (rotations per minute). Each arm has a nozzle that sprays out water to clean a path of 8 to 30 inches in width. This attachment moves along the surface cleaning a path. It cleans a wider path than just using the wand alone, so it will take you much less time to clean an area. This can cut the amount of energy that you have to expend as well, because the power washer and surface cleaner attachment cleans the area for you without you having the scrub or scour. Where can you use concrete surface cleaners? Surface cleaners are great for using on flat surfaces. This includes driveways, sidewalks, concrete floors, boat ramps, and more. If it is a flat area, then it can be cleaned using a surface cleaner. They can remove dirt, algae, fuel, oil, grease, etc. from your flat surface in no time. They are especially helpful in keeping basketball and tennis courts clean, as well as saunas and around the pool. You will be amazed at how much use you can get out of this addition to your power washer. Concrete surface cleaners can save you money, too. Less water is needed to clean your area, because the surface cleaner spreads the water out between the arms, which cleans a wider path than just using the water wand alone. This can save you on your water usage, which translates into saved money on your water bill. That sounds good, doesn’t it? 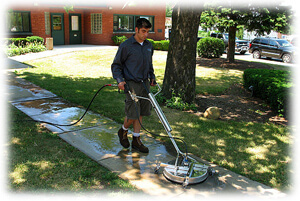 A surface cleaner attachment can be used with a hot or cold water pressure washer, whichever you have. This is great news for you, because depending upon the stain or dirt that you are trying to remove and the surface that you are cleaning, you may need to use a hot water pressure washer sometimes. Hot water pressure washers work great on oily or greasy stains and when you combine the hot water with the concrete surface cleaners, you will be able to remove those greasy spots in no time. Just be sure that you do not use the hot water pressure washer on rubber or plastic surfaces. Concrete surface cleaners can cut your cleaning time considerably. If you have a large area that needs to be cleaned, then you will find that the surface cleaner can make the task easier time-wise, energy-wise, and financially. Your pressure washer with a surface cleaner attachment can make cleaning any flat surface quicker, so that you have time for some of the more important things in life.